The 23,595 square-foot spa combines healing rituals with a signature product line. Located in the village of Kohler, one hour from Milwaukee, the American Club has continually won the prestigious AAA Five-Diamond Resort Hotel award. Owned by the Kohler Company, the hotel, listed as a National Register of Historic Places landmark, was built in 1918 to lodge the corporation's European immigrant employees. The 26,320-square-foot Kohler Waters Spa combines unique hydrotherapy healing rituals with Kohler fixtures and features a signature hollyhock product line named for the flower of the village of Kohler. Destination Kohler has four championship golf courses, a 500-acre private wilderness preserve with 10 miles of hiking trails, and a shopping center. Dining options include no fewer than 12 restaurants, and the 100,000-square-foot Sports features an exercise room, two swimming pools, tennis courts, and a café. 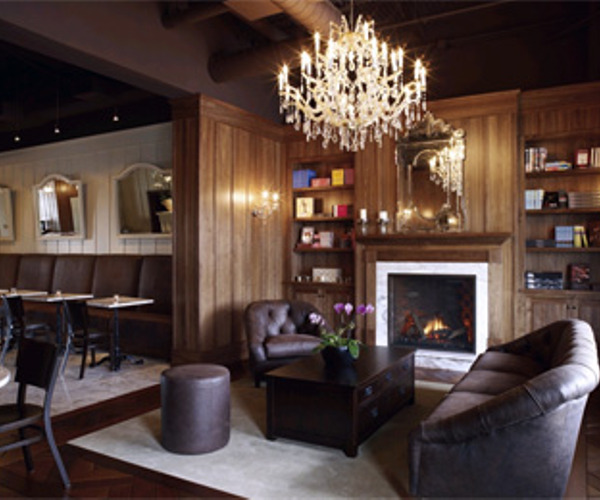 Located in the Carriage House, the Kohler Waters Spa at The American Club is a Forbes Fve Star-awarded establishment. The European-style spa has 26 treatment rooms, in addition to separate men's and women's lounges with saunas, steam rooms, baths, cold plunge pools, and, of course, Kohler fixtures. Bathed in yellows and greens, with soft music playing, the spa offers a soothing ambience, while sleek black-and-white tile and tumbled stone accents create a sophisticated touch. The extensive spa menu offers more than 50 treatments, including massage, energy work, facials, body scrubs and wraps, and innovative treatments like Riverbath®. The spa's signature wet treatment rooms--Acoustic, Riverbath, and Harmony--offer therapeutic water services like the Acoustic Bath, a bathing experience that blends music and sound vibration, along with a body scrub and Vichy hydromassage, and Lavender Rain, a combination of a lavender and eucalyptus scrub, wrap, and warm Vichy shower. Hair, makeup, and mani/pedi treatments can be taken in the finishing spa. The 26,320-square-foot spa also encompasses a boutique and relaxation pool with an eight-foot waterfall. Guests can also choose to relax on the glass-covered rooftop deck, which holds a fireplace, lounge space, and coed whirlpool. Destination Kohler is rife with recreational opportunities for guests. The 100,000-square-foot Sports Core Health & Racquet Club features a range of circuit and weight-training equipment from the Precor, Life Fitness, Lifecycle, and Stairmaster brands. Personal training is offered, as are a bevy of classes such as cross training, aquatic fitness, kickboxing, yoga, Pilates, and spinning. In addition, the sports club has family and lap swimming pools, a TV lounge, indoor/outdoor Jacuzzis, and men's and women's steam rooms. Four golf courses, comprising an impressive 72 holes, have played host to PGA Championship and U.S. Senior Open tournaments. There are also six indoor and six outdoor tennis courts and a shopping center. Daily scheduled guided tours throughout the Kohler factory, design center, gardens, and the Waelderhaus provide guests a glimpse into the company's history and development. Wedding and meeting accommodations are available. Guests reserving rooms, including the nine Governor Suites, will enjoy amenities such as Baker or McGuire furniture, refreshment centers, and Kohler Whirlpool baths and showers. Two one-bedroom Presidential Suites (1,450 square feet) feature extras like separate living and dining areas, fireplaces, several TVs, and Kohler dual whirlpool baths. Those staying in the Carriage House, located in the same building as Kohler Waters Spa, can enjoy amenities like spacious sitting areas and sunrooms housing Kohler whirlpool baths. Guests can select from an extensive listing of the American Club's appetizing restaurants, with hearty culinary options ranging from fine dining to café style. Modern cuisine in an Old World setting is featured at the Four Diamond-awarded Immigrant Restaurant, and the Wisconsin Room, which serves Midwestern specialties, gives diners a look into the past with oak paneling, antique chandeliers, and leaded-glass windows. The Greenhouse garden café, housed in an antique solarium imported from Europe, allows guests to indulge in tasty treats and refreshments, while the Craverie Chocolatier Café offers light fare and Kohler signature chocolates. Guests can enjoy a pub-style menu at the Horse & Plow, a historic tavern that was originally the tap room for Kohler Co. workers. Take 5 Café, located in the Sports Core fitness center, offers soups, salads, and Panini sandwiches.